Packed with some of India's top attractions, Maharashtra stretches from the country's western coast to its central section, encompassing equally varied landscapes and climates. Home to the most industrialized region in India, this sprawling state also boasts thriving agricultural and tourism sectors. Begin your tour of Maharashtra in Mumbai, India's commercial capital and hub of the successful Bollywood film and TV industries. Beyond this immense, cosmopolitan city, you can explore Buddhist caves, ancient temple complexes, modern beach resorts, national parks, and pleasant hill stations that the European colonists used as summer retreats. 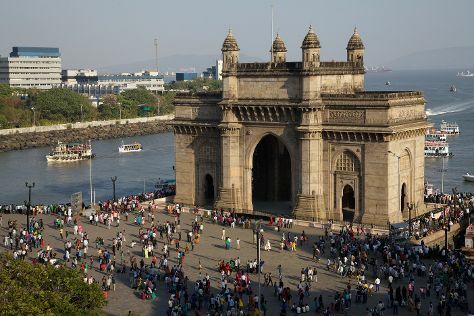 Mumbai (Bombay): While the chaos of India's biggest city can become too much for many visitors, most Maharashtra itineraries include some time in Mumbai, and many tourists fall in love with its hidden gems and constant buzz of life. Pune: If Mumbai is the state's unavoidable hub, then Pune is the real gem of Maharashtra tourism, with its gorgeous pre-colonial architecture, wealth of culture and history, and picturesque surrounding nature. Aurangabad: A relative oasis of quiet compared to some of the larger destinations in Maharashtra, this historical city offers a wealth of Mughal-era palaces and World Heritage Sites in the form of spiritually significant caves. Mahabaleshwar: This charming hill station, perched above one of the country's greenest forests, attracts visitors with its lofty views over the surrounding, undulating landscape. Gateway of India: Standing guard over the sea, this iconic arched building harks back to the days of the British rule, and remains one of the most recognizable landmarks of tourism in Maharashtra. Bandra-Worli Sea Link: Don't miss the opportunity to take some excellent photos of this world-famous cable bridge, a feat of architecture that connects Mumbai's city center with a large suburban district. Marine Drive: Serving as the city's main promenade and boasting some of its finest architecture, this expansive seafront road buzzes day and night with locals looking to meet up, go for a stroll, or spend a romantic moment with their partner. Shree Siddhivinayak: Immense on the outside and ornate on the inside, this castle-like Hindu temple dedicated to Lord Ganesh was extremely popular among the rich and famous in the 20th century, and remains one of the most-visited attractions in Maharashtra. Chhatrapati Shivaji Terminus: A train station is usually the last place you'd choose to visit while on vacation, but take one look at the elaborate facade of this World Heritage Site and you'll understand why it's considered one of the highlights of Maharashtra. Imagica Theme Park: Splash down at this eco-friendly water park, which makes clever use of rainwater to ensure that your high-energy romp has as little impact on the environment as possible. Ajanta Caves: With its oldest caverns dating back more than two millennia, this Buddhist cave complex has a mysterious allure worthy of its title as a World Heritage Site. Ellora Caves: Just as impressive as the nearby Ajanta Caves but without quite the number of visitors, this famous Maharashtra attraction offers a mix of Buddhist, Hindu, and Jain influences, and also proudly boasts the World Heritage Site label. Shreemant Dagdusheth Halwai Sarvajanik Ganpati: An elaborate and extremely expensive statue of Lord Ganesh dominates this decadent temple, built in the late 19th century by a rich and prominent businessperson. Mapro Garden: When The Beatles sang their famous song "Strawberry Fields Forever," they could conceivably have been referring to this massive park, which produces an incredible 85 percent of strawberries grown in India. When you embark on a Maharashtra vacation, your itinerary will almost certainly begin in Mumbai (Bombay). While the mega-city has plenty of activities and attractions to entertain the little ones, they might find the pace and chaos of the city too hectic to handle for more than a few days. If that's the case, head to Pune, where you can enjoy many of the highlights of Maharashtra in a more laid-back environment. You and the family can relax even more at Mahabaleshwar, a hill station surrounded by lush nature, where the stress and pollution of the big cities will seem a million miles away. If you decide to spend a few days showing the kids around Mumbai during your holiday in Maharashtra, make sure you balance historical attractions like Shree Siddhivinayak with visits to more child-focused places, such as Imagica Theme Park. Combine a taste of history with the chance to explore at Ellora Caves and Ajanta Caves--the kids will feel like Indiana Jones as they delve deep into these storied caves. Add a fresh touch to your Maharashtra itinerary by visiting Mapro Garden, where you and the kids can pick and eat as many fresh strawberries as you can carry. The state has some of the best-developed tourist infrastructure in India, and as such offers an array of comfortable family hotels, often at very reasonable prices. Don't let the kids out of your sight when crossing the road--especially in Mumbai (Bombay)--as the traffic can be beyond chaotic and takes some getting used to. Remember that, as in other parts of India, poorly maintained roads and outdated public transportation means that getting from place to place during your Maharashtra holiday can take a lot longer than you expect, so bring some games to keep the kids entertained on the bus or train. As with many other states in India, a trip to Maharashtra can be heavenly for vegetarians and vegans. Traditionally, the state's Hindu population avoids cooking with meat unless the animal has died of natural causes, meaning you can enjoy a healthy array of dishes based around lentils, peanuts, cashews, and all manner of fresh, seasonally grown vegetables. Head to coastal destinations in Maharashtra, such as Mumbai (Bombay) and Kashid, for the chance to try a delicious range of seafood curries flavored with aromatic spices. If fiery food doesn't appeal to you, check with restaurant staff to make sure you don't accidentally order a chili-laden dish. Unsurprisingly for one of the biggest cities in the world, Mumbai offers just about everything you could possibly need during a shopping holiday in Maharashtra. Reflecting India's multi-tiered society, the city offers everything from expensive brand names at ultra-luxurious shopping malls, such as the enormous High Street Phoenix, to bustling open-air markets like Chor Bazaar. Shopping in Pune caters more specifically to tourists, serving as the perfect place to buy souvenirs and jewelry during your Maharashtra vacation. Surely the most significant political holiday in the state falls on May 1--Maharashtra Day--a celebration of the day the state came to exist in 1960. If you visit Maharashtra on that day, you'll witness street festivities and inspiring political speeches, especially in the state capital. February 19 also sees celebrations across a range of destinations in Maharashtra, as the state commemorates the birth of the warrior king Chhatrapati Shivaji. Deepavali, the Indian festival of lights, takes place on October 20 and serves as one of the best reasons to take a trip to Maharashtra. Bring some wet weather gear if you decide to take a trip to Maharashtra between June and September--the state's monsoon season brings heavy rains and humid, sticky weather. This affects coastal regions, while inland Maharashtra destinations, such as Pune and Aurangabad, tend to experience less significant rainfall. Temperatures soar between March and May, with the hot, dry weather making for potentially uncomfortable conditions, although less so in higher-altitude hill stations like Mahabaleshwar. Overall, the best time for sightseeing in Maharashtra is in winter, between December and February, when you can enjoy cooler, relatively dry conditions. Maharashtra has perhaps one of India's best transportation systems, with the largest and perhaps best-maintained road network in the country. Getting around Mumbai (Bombay) during your Maharashtra holiday can still be a nightmare, as the city doesn't have a metro network. Taxis and rickshaws serve as the easiest way to get from place to place, with local buses often packed to the brim. An extensive--although slow and crowded--rail network provides the best way of getting between cities on your Maharashtra itinerary, although you might be better served to hire a professional driver if traveling with the whole family.